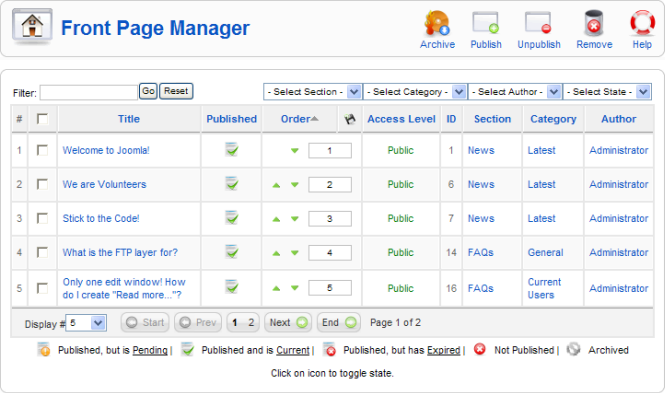 Select Content → Front Page Manager from the drop-down menu in the back-end of your Joomla! installation. You can also click on the "Front Page Manager" icon in the Control Panel. The Front Page Manager is the place where you control which Articles are displayed on the Front Page and in what order they are displayed. The Front Page is often the Home page of a web site, but it can be any page in the site. The Front Page is created using a Menu Item with the Front Page layout. You can toggle the Published state on and off by clicking on the icon in this column. A status of Pending means that an Article's Start Publishing Date is in the future. You can hover on the icon to see an Article's Start and Stop Publishing dates. Order. The order in which to display the Articles on the Front Page. If the list is sorted by this column, you can change the order by clicking the arrows or by entering the sequential order and clicking 'Save Order'. Note that the display order on the Front Page is set in the Parameters - Advanced section for the Front Page Blog Menu Item. To sort Front Page Articles using this Order value, set the Category Order to "No. Order by Primary Order Only" and set the Primary Order to "Default". If these Parameters are set to other values (for example, "Oldest First" or "Title (Alphabetical)"), then the Articles will be sorted that way and this column will be ignored. You can change an item's Access Level by clicking on the icon in the column. Section. The Section this item belongs to. Clicking on the Section Title opens the Section for editing. See Section Manager - Edit. Category. The Category this item belongs to. Clicking on the Category title opens the Category for editing. See Category Manager - Edit. Author. Name of the Joomla! User who created this item. Clicking on the Author opens the User for editing. See User Manager - Edit. Archive. To change one or more Articles to Archived status, select them and press this button. Archived Articles are retained on the site and are available for viewing on Menu Items with a Type of Archive Layout. They can not be published to other pages while set to Archived status. Note that Articles assigned to the "Uncategorized" Section will not show on the Archived Article List layout. Remove. To remove one or more Articles from the Front Page, click on the checkbox for each Article and press the Remove button. The removed Articles may still be available on other pages. This only removes them from the Front Page. You can filter the list of items either by entering in part of the title or the ID number. You can also select a combination of Section, Category, Author, and Published State. Select Section. Use the drop-down list box to select the desired Section. Only items in this Section will display. You may also select 'Uncategorized'. You can control the number of columns, number of articles, and other features of the Front Page layout in the Menu Item Manager - New/Edit - Front Page Blog Layout.